Asa Butterfield plays Hugo Cabret in HUGO, from Paramount Pictures and GK Films. (c) 2011 GK Films, LLC. Photo credit: Jaap Buitendijk. All Rights Reserved. The foyer in my home is adorned with a painting of a bustling Paris street scene. The picture draws me in, making me want to be a part of that scene. “Hugo” has the same effect. The visual nuances of the movie are reminiscent of a beautifully crafted storybook, which is fitting since it’s based on the 2008 Caldecott Medal winning book, “The Invention of Hugo Cabret.” Author Brian Selznick’s novel, about 500 pages long, is told with black and white illustrations as much as with text, providing a built-in storyboard for filmmakers. Academy Award™ winning director Martin Scorsese (“The Departed” 2007), with the help of his excellent team, has done a marvelous job of transforming a highly lauded children’s book into an equally impressive family movie. You know those awards given out for technical stuff that you either don’t understand or don’t care about? “Hugo” should be a contender for all of those: cinematography, editing, set direction, art direction, costume design and musical score. It’s all exquisitely orchestrated, resulting in a fantasy/adventure that can be enjoyed by young and old alike. While it’s a movie to be enjoyed by all, aficionados of films and literature will especially love it. Why? The plot involves one character’s passion for books, one’s passions for watching movies, and one’s passion for filmmaking, along with an abbreviated history of how filmmaking got its start. The history, which picks up in the last act, is both educational and charming. Scorsese incorporates actual footage of old films, and also reenacts the filming of the movies. The story takes place in Paris, much of it inside a sizable train station, as the protagonist is an orphan boy, Hugo Cabret, (Asa Butterfield, “The Boy in the Striped Pajamas” 2008) who lives within it’s walls. During flashbacks, we learn that Hugo and his father (Jude Law, “Contagion” 2011) were trying to repair a mechanical figure called an automaton. Tragedy struck before they could complete the task, leaving Hugo in the care of his drunken uncle, who lived and worked at the train station as the clock keeper. Now, in 1931, his uncle has disappeared and Hugo’s the one who, secretively, keeps the clocks running and in repair. If the all too serious Station Inspector (Sasha Baron Cohen, “Borat” 2006) catches him, he will be sent off to the orphanage. Cohen’s embodiment of this character is most gratifying and I found myself anticipating his screen presence. Like Don Knotts as Barney Fife, he is able to play a bumbling dolt in a serious manner. Hugo’s bird’s eye view of the bustling station from behind the many clocks, high above the crowd, is perfect for people watching…and spying. The toyshop and its owner (Academy Award™ winner Sir Ben Kingsley, “Shutter Island” 2010) are of particular interest to Hugo; that’s where he can find small parts to help him maintain the clocks, and perhaps repair the automaton. Hugo’s true adventure begins on the day that the shopkeeper, Pappa Georges, catches him trying to steal. This event leads Hugo to a friendship with Isabelle (Chloë Grace Moretz, “”Let Me In” 2010), and subsequently, to a mystery unlocked by the automaton. The story is one of loss, loneliness, mystery, magic, passion, adventure and purpose. Hugo knows the importance of purpose. He tells Isabelle, “If you lose your purpose, its like you’re broken.” Nostalgia also plays a big role, similarly to the way it did in last summer’s “Super 8,” although a few decades earlier. 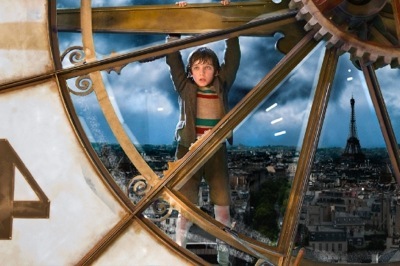 Being that this movie takes place in the 1930’s and involves massive clocks, it is full of interesting gizmos, gears and gadgets, artistically captured, adding to the joy of seeing “Hugo” on the big screen. The opening scene will clue the viewer in right away to the fun of it all, as the inner workings of a clock are seamlessly transformed to an aerial view of Paris, The City of Lights. I saw the film twice, once in 3D, and unless you are all about 3D, I don’t think it’s necessary to spend the extra money. Running at 2 hours, it may be a little long for very young children; it’s probably best for children aged 8 and up. Bottom Line: Scorsese has proven that he is more than capable of making a family friendly film. “Hugo” provides a wonderful message to go along with the visual enjoyment received from the film. Credits: Directed by Martin Scorsese; Screenplay by John Logan; based on the novel, “The Invention of Hugo Cabret” by Brian Selznick; Produced by Scorsese, Graham King, Tim Headington, Johnny Depp.